The SystemBuild latitude wall cabinet with cubbies transforms unused wall sections into storage space. In rooms with limited open floor area, this wall cabinet is the perfect way to increase your storage options. The cabinet has 2 doors that open to cabinet space with 1 fixed shelf and 1 adjustable shelf to fit items of varying sizes. The soft closing hinges on the doors will keep your cabinet looking great for years! below the doors are 4 open cubbies for additional storage of small items you want to grab quickly. Ideal for workshops, craft rooms and laundry rooms, this wall cabinet will fit right in with a simple white finish and Gray frame. 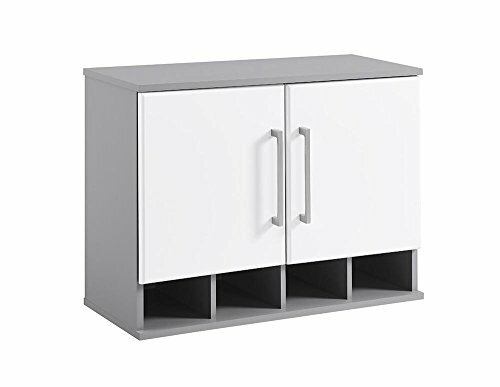 No matter which room needs a little extra storage, the cabinet offers a convenient, space-saving design, and is made of laminated particleboard and mdf with PVC door fronts for a sturdy construction. The EZ hanging technology is simple to use – first hang the wall hanger where you wish your cabinet to hang and then mount the cabinet to the wall hanger for a sturdy and level hang on the first try! two people are recommended for assembly, and Once assembled, the wall cabinet has dimensions of 20.9”H x 27.7”W x 11.7”D.